In addition to the Big 5 factors, there are other specific aspects of your character that are of particular interest to employers. People applying for jobs in retail, banking, or the security services industries are often asked to take an integrity test which claims to predict if they will lie, cheat, or steal on the job. These tests are administered by an estimated 6,000 US organizations and taken by as many as 5 million people each year. These tests may be either self-contained or the questions may form part of a general personality questionnaire. There is concern in the testing industry regarding some of the companies who have recently entered this particular sector of the psychometric test market. The American Psychological Association found that more than half of integrity-test publishers do not require any training or other qualifications of people who administer their tests and many of these tests simply aren't valid. A review conducted by the US federal government's 'Office of Technology Assessment' found that over 95% of people who fail integrity tests are incorrectly classified as dishonest. 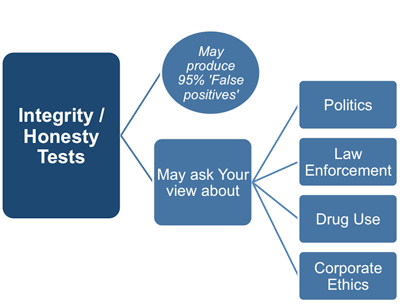 In addition, these tests may also invade your privacy, inquiring into your beliefs about politics, law enforcement, drug use, and corporate ethics. Such tests are not seeking to understand your personality so much as to enforce conformity, and while test takers are told that ''there are no right or wrong answers" to these questions, this is obviously untrue. In addition, some companies selling these tests have opted to use sales messages which cultivate distrust and suspicion. Some of the marketing material is extremely inflammatory and it is disturbing that these companies can actually find a market for their product. Many of these same companies have put minimal effort into the development of their tests, most of which are not based on any worthwhile psychological research. Unsurprisingly, these two factors have made many people suspicious of and hostile to this type of test and some of this negative feeling has unfortunately and unfairly transferred itself to personality questionnaires generally. The increasing use of integrity tests begs the question, are employees more likely to be dishonest nowadays than in the past? Unfortunately, the answer to this question is probably ‘yes’. The reasons are not hard to fathom, organizational loyalty has largely disappeared as a result of companies’ willingness to restructure or downsize at home and move jobs offshore where labor costs are cheaper. The increase in so-called ‘McJobs’, where investment in staff training and development are minimal and the job itself is unrewarding and stressful have further eroded employee’s loyalty to their employer. In some jobs the results of employee dishonesty, whether it involves the theft of goods or time, may go unnoticed for long enough to be very costly. Organizations are therefore likely to err on the side of caution and reject you if there is any doubt about your integrity, however unfounded this doubt may be. It is therefore vital that you recognize these integrity questions and respond to them appropriately. Stress is a prevalent and costly problem in today's workplace. About thirty percent of workers report high levels of stress. Twenty five percent view their jobs as the number one stressor in their lives and seventy five percent believe the worker has more on-the-job stress than a generation ago. Evidence also suggests that stress is the major cause of turnover in organizations. These conditions often lead to poor work performance. Stress is also associated with various biological reactions that may lead to compromised health, such as cardiovascular disease and various cancers. Problems at work are more strongly associated with health complaints than are any other life stressor, more so than even financial problems or family problems. Stress is regarded as a bad thing by employers. Stress is often defined as ‘anger turned inwards’ and is implicated in a long list of medical conditions from migraines to heart attacks. It is also a precursor to ‘workplace rage’ (known in the US as ‘going postal’) which along with ‘road rage’ and ‘air rage’ is a recent and rapidly increasing occurrence. Both of these outcomes, illness and violence, are very expensive from an employer’s point of view and questions aimed at screening out stressed or angry candidates are finding their way into personality questionnaires. As is the case with integrity, organizations are likely to err on the side of caution and reject you if there is any doubt about your stress level, however unfounded this may be. It is therefore vital that you recognize these stress questions and respond to them appropriately.